I offered my sister three choices of hikes, so it’s not my fault. At least, that’s what I keep telling myself. 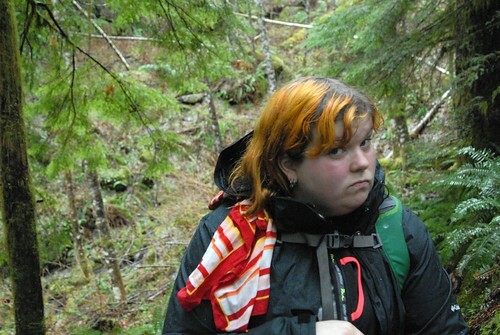 As you can see from my sister’s face, she was not too certain about her life choices after about an hour of hiking. Nonetheless, we opted to skip the Bridal Veil Falls spur and go for the lake. Up, up, and up we climbed. We started with pleasant conversation and slightly damp weather, but by the top it was colder and quieter. We took a leisurely pace and plenty of rests, but the climb is a brutal one for the inexperienced and tough for experienced hikers, as my calf muscles are reminding me today. To be honest, it’s really these damn stairs that are the problem. I understand they’re there to prevent erosion, but they are clearly made for giants and us short people are forced to take huge steps up where smaller steps would probably be just as excellent. Nonetheless, we weren’t raised to be quitters so we climbed all the damn stairs despite the strain of every leg muscle and made it to the lake in a little over four hours. The first log we saw provided respite for our weary legs and I unpacked the PB&J’s and oranges and we drank in the spoils of our stubbornness. 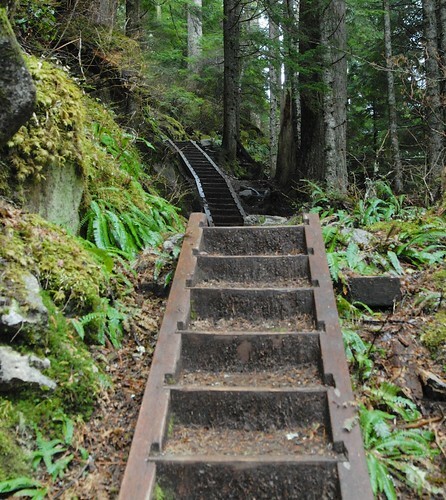 As with every hike, what goes up must come down. Light was of a premium, so we agreed to hurry a bit on the way down. That was an agreement that didn’t really pan out as we were still pretty beat from the ascent. So, as the kids who passed us on the way up also passed us on the way down, we made our way carefully down the ice at the top and the giant stairs the rest of the way. The last mile or so of our adventure was completed in the dwindling twilight and the sight of my sister’s monster truck and the promise of a sturdy heater was a welcome shadow, indeed. In the hopes that she’d hike with me again, I bought her some pizza. 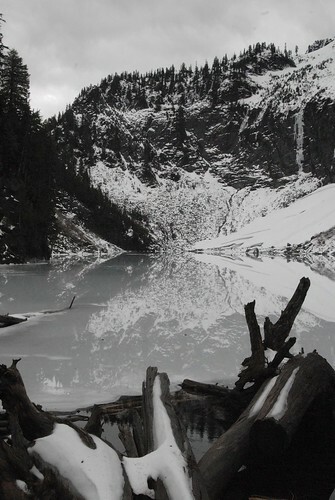 I doubt that will be enough, but at least she can say she’s been to Lake Serene in the winter, when it is most beautiful!